David Kesmodel reported in today’s Wall Street Journal that, “While many U.S. farmers grappled with lower grain prices last year, Mike Baker had an ace up his sleeve: sorghum. Grant Gerlock reported yesterday at The Salt blog (National Public Radio) that, “U.S. farmers are bringing in what’s expected to be a record-breaking harvest for both corn and soybeans. But for many farmers, that may be too much of a good thing. The update noted that, “That means a glut of corn and soybeans and the lowest prices in at least five years. 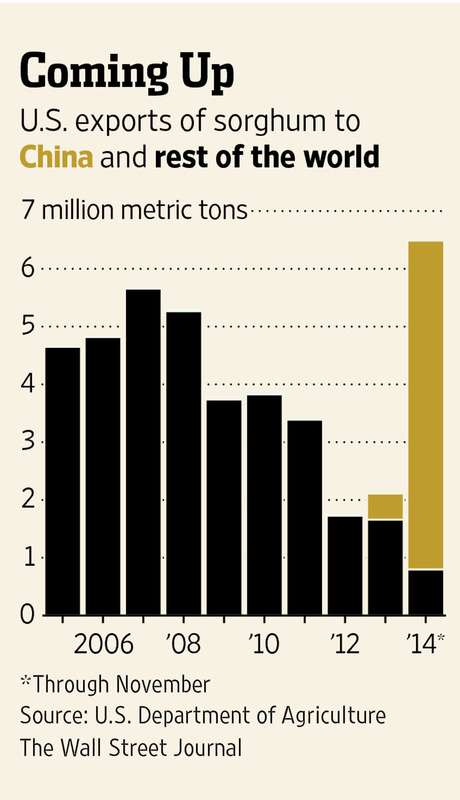 To make matters worse, the oil boom in North Dakota is tying up the railways used to ship grain. Trains for things like coal or imports are also running behind. Bruce Blanton at the U.S. Department of Agriculture says the wait means some of the harvest could go to waste…[S]ome farmers will have so much grain to sell, they’ll still manage to make some money. Others will lean on saving or subsidized crop insurance. Low prices could even trigger a new set of government safety nets in the Farm Bill. “Cory Walters, an agricultural economist at the University of Nebraska-Lincoln, says rising costs for everything from seeds to fertilizer make these low commodity prices harder to handle. Marcia Zarley Taylor reported on Friday at DTN that, “A Halloween forecast by Purdue University paints a grim outlook for the grain economy through at least 2015, and possibly the next three or four years. The DTN article noted that, “In a webinar on the changing business climate for agriculture, Hurt and other Purdue economists emphasized that cash rents and farm input costs have been slow to adjust to the new realities of commodity markets. The main problem is that production costs need to fall by about 20% to realign with the current price outlook. Yesterday, the Food and Agricultural Policy Research Institute (FAPRI) at the University of Missouri provided an update on crop price projections reflecting information available in mid-October. A summary of the FAPRI update indicated that, “The projected corn price for the 2014/15 marketing year was reduced slightly this month, to $3.40 per bushel. The record U.S. corn crop got even bigger in USDA’s October estimates, and carry-in stocks were also greater than had been estimated in September. Yesterday’s update added that, “USDA soybean production estimates also increased slightly this month, but this was offset by a reduction in carry-in stocks, leaving total supplies marginally reduced from September estimates. The projected 2014/15 soybean price is little changed from last month, at $9.95 per bushel. Yesterday, the Federal Reserve Board released its Summary of Commentary on Current Economic Conditions. Commonly referred to as the “Beige Book,” the report included several observations with respect to the U.S. agricultural economy. A summary of the ag related comments can be found here, at FarmPolicy.com Online. In part, yesterday’s report noted that, “Lower corn prices continued to benefit poultry and livestock producers that rely on corn for feed” (Atlanta District); “Livestock and dairy producers continued to benefit from lower feed costs and high output prices” (Minneapolis District); “Cattle prices continued to be at a record high while feed prices fell, boosting profitability for cattle producers” (Dallas District) and “low corn prices and stable fertilizer and machinery prices benefited dairy and feedlot operations” (San Francisco District). Reuters writer Julie Ingwersen reported yesterday that, “U.S. corn futures rose 3.6 percent on Monday, the second-biggest single-day jump of 2014, as rains in the Midwest interrupted the harvest and slowed the arrival of a record-large crop into marketing channels, traders said. “Soybeans and wheat followed corn’s lead, with a weaker dollar supporting grains, making them more attractive to those holding other currencies. Jonathan Oosting reported yesterday at the MLive Media Group Online that, “Some 150,000 Michigan families are poised to lose an average of $76 in food stamp benefits this fall due to federal cuts that many other states have taken action to avoid. “The latest farm bill, signed into law here in Michigan last winter, scaled back the Supplemental Nutrition Assistance Program, which includes a provision affording extra food benefits to families who also receive assistance with heating bills. Gregory Meyer reported yesterday at The Financial Times Online that, “Illinois is at the centre of an astonishing rebound in global grain supplies. After almost a decade of shortfalls and price rises, agricultural commodities have declined to the cheapest in four years. The new abundance will have broad effects, weakening incomes of farmers and companies that supply them, fattening profit margins at food and biofuel companies and – eventually – slowing food price inflation for consumers in rich and poor countries alike. Tom Meersman reported over the weekend at the Minneapolis Star-Tribune Online that, “The prospect of a bin-busting crop has driven corn prices to their lowest levels in four years and raised fears of a prolonged slump for crop farmers in Minnesota and elsewhere.